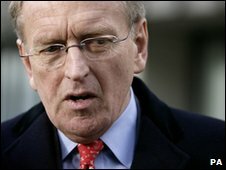 Some sharp comments by a former British ambassador to Washington during the Iraq inquiry have again cast doubt on the strength of the so-called "special relationship" between Britain and the United States. This raises the possibility that the Iraq war will be seen as a moment after which that relationship took a real downturn. Indeed, it is arguable that the "special relationship" of the second half of the 20th Century and since has been something of a departure from what at times has been an antagonistic one. The latest signs of what might be a historic decline came when the ambassador, Sir Christopher Meyer - always ready with a quote - said that during the lead-up to the war on Iraq in 2003, Britain failed to make its influence felt on two fronts. First, it did not insist, as a condition for its support, on progress in the Middle East peace process and on better planning for post-war Iraq. Second, it did not get a commercial trade-off. Its demands for changes to an air services agreement and steel tariffs were ignored. Sir Christopher remarked: "I said to London: 'The key thing now, quite apart from Iraq, is to translate this popularity into real achievements which benefit the national interest', and we failed." The picture he painted was one in which the then British Prime Minister Tony Blair was very much the junior and perhaps dispensable partner. And so it also seems with Afghanistan. British Defence Secretary Bob Ainsworth, under huge pressure from a relentless procession of casualties and coffins, let slip the other day his frustrations over the slowness of President Barack Obama's decision-making procedures. This "hiatus", as he put it, the British losses and the Afghan elections, had "mitigated against our ability to show progress". History, in fact, warns us not to expect too much from this transatlantic relationship. Dean Acheson, President Truman's secretary of state, is well-known for saying that Britain had lost an empire and not found a role and that the special relationship had "about played out". But he also had this perspective: "Of course a unique relationship existed between Britain and America. But unique did not mean affectionate. "We had fought England as an enemy as often as we had fought by her side as a friend." After all, the relationship began in war in the 18th Century and continued in war at the beginning of the 19th. The "War of 1812" actually went on until 1815. Perhaps it is confined in its title to one year out of politeness by both sides. That war was about trade and it was a signal that dealing with the United States on trade matters was always going to be tough. It is. You can be the closest American ally, yet at the commercial negotiating table you are an adversary, as Sir Christopher experienced. Throughout the 19th Century there was rivalry between the US and UK - in the earlier decades because the US boundaries had not been set and there was competition for land. This sometimes nearly spilled into armed conflict. In the 1840s, President James K Polk was pressed by Democratic party rivals - the then hawks - to declare that the northern US border should extend to the Pacific along the line of 54' 40". The cry went out: "Fifty-four Forty or Fight." In fact there was no fight. In an act of statesmanship, the border was extended along the 49th parallel and peace has reigned ever since, apart from an incident or two later when Irish Fenian supporters raided across into Canada. Ireland would often be a thorn in the side of the relationship. Commercial rivalry followed as the young republic developed its muscles and the old empire fought to cling to its dominant world position. The historical pattern is that interests are usually different and that therefore policies often diverge. This was apparent during the American Civil War when the North complained that the British favoured the South too much, especially by building ships for it. Before World War I there was no question that the isolationist US should intervene to help Britain, and it was not until 1917 that the US entered the war - then only because of the German policy of unrestricted U-boat warfare. And the Irish question could always have its impact. Chicago Mayor Big Bill Thompson, at the time when the British Black and Tans were on a rampage in Ireland, declared that if he had the chance he would "bust King George in the snoot". Between the wars there was naval rivalry, ended by the Washington Treaty of 1922, which incidentally had the unfortunate consequence of disarming those who would later face Hitler. The Royal Navy had to rely too much on ships laid down in World War I, among them its flagship HMS Hood, the "Mighty Hood", which lasted barely fives minutes against the Bismarck in 1941. This treaty, between friendly rivals, is one reason why American neo-conservatives were later so suspicious of treaties between adversaries. It was not, of course, until the US entry into World War II that the "special relationship" really developed. 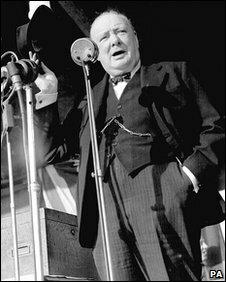 Churchill was typically world-embracing when he used the term in his Fulton speech in 1946: "Neither the sure prevention of war, nor the continuous rise of world organisation will be gained without what I have called the fraternal association of the English-speaking peoples... a special relationship between the British Commonwealth and Empire and the United States." Churchill's view was too ambitious. US leadership during the Cold War was based on far more than friendship between English-speaking peoples - on Nato for a start. Britain has declined from being the master, to being a rival, to being a partner and now to being perhaps simply useful. What still counts is a security sharing arrangement and trust, which has included the US giving the UK first the Polaris and then the Trident nuclear missile. 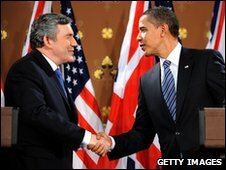 Diplomacy ebbs and flows but in a big world, the UK is getting smaller and perhaps the US simply less interested.